Growing up, I never understood why grownups got so stressed about Thanksgiving. I mean seriously, what’s the big deal? You eat turkey, you shove some vegetables around your plate so that it looks as though you’ve eaten them and then you watch Miracle on 34th Street. Everyone goes to sleep happy and the next day you have leftovers. Well, now that I myself am a grown up, I’m beginning to understand. On Monday night, for example, I told one of my supervisors that I needed to talk to her about competition routines before she left for the evening. Her response? “I have 25 people coming for Thanksgiving dinner.” In other words there would be no talk of competition routines until after Thursday. It wasn’t until I studied abroad and found myself in charge of my very own Thanksgiving dinner that I realized how much work goes into playing hostess. And even though I’m not hosting this year, I’m involved with someone, which means double the turkey, double the driving and double the stress. In another hour or so, I’ll be off to The Wedding Date’s. He’ll be at work but this will give me the chance to start baking without my grandmother threatening to “liberate” my supplies every three seconds. It will also ensure that I have enough time to prepare two desserts: one for his parents’ Thanksgiving dinner, which we’re attending on Thursday, and one for mine, which we’re attending on Friday. Thankfully our families celebrate on different days so there weren’t any major issues there. The real drama, however, has been the transportation. So everything was fine and good until yesterday when I received a text message from my brother at 7:00am. He’s bringing a date. A platonic date but a date nonetheless. And as a result, I’ve been booted from the car. My dad (ever the micromanager when it comes to transportation) starting suggesting all sorts of harebrained, environmentally friendly solutions and my brother (ever the clueless younger child) suggested I drive down with our mother today, completely forgetting that the entire reason we’d initially decided to drive down together was because I have a BOYFRIEND this year. All I can say is bring on the cocktails. I like Landlord. She’s so awesome. Also, despite the fact that chickens mooing is pretty amusing, I am now convinced (or obsessed? ): you should use this picture every day. I know, I was like “Hmmm… this is a bit off color and possibly offensive” but what can I say? 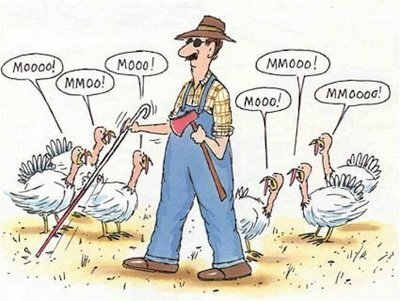 I have my dad’s sense of humor 🙂 Happy Turkey Day to you and yours! She Who Rules the Roost (and does the cooking) always has the last word, because she can always go on strike. She has that move in her back pocket whether she uses it or not. I know, because I always do the cooking on Thanksgiving. I’ve never had to use it, but I’ve certainly put the hammer down. Thank you, thank you, thank you…LOL It all worked out, and everyone survived, we had plenty to eat and DRINK, thank goodness.